Wash tomatoes, cucumbers and spring onions. Next slice the vegetables or cut them into circles. Chop spring onions finely. Combine mustard, sugar, salt, pepper and sunflower oil. Mix the ingredients properly. Add vinegar stirring the mass continuously. 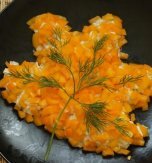 Dress the salad with the prepared mustard sauce. 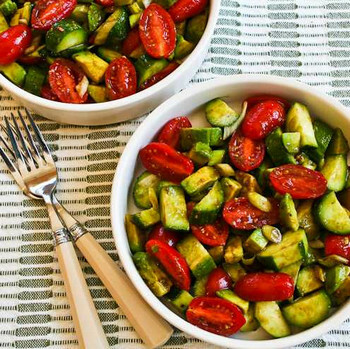 Serve the tomato and cucumber salad with mustard sauce at once. Tip! 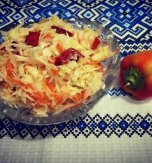 The salad could taste more tender if you peel tomatoes and cucumbers. 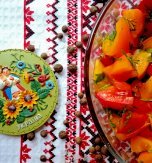 Beforehand you should place tomatoes in a hot water for 1 minute. Then swill out them. In that case it would be easier to peel the tomatoes. 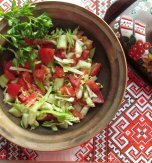 Have you liked the recipe for a cucumber, tomato, and onion salad? Find us on Facebook, Instagram, Pinterest, Yummly, etc. 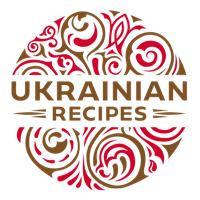 to comment and share your favorite Ukrainian recipes with friends and relatives!